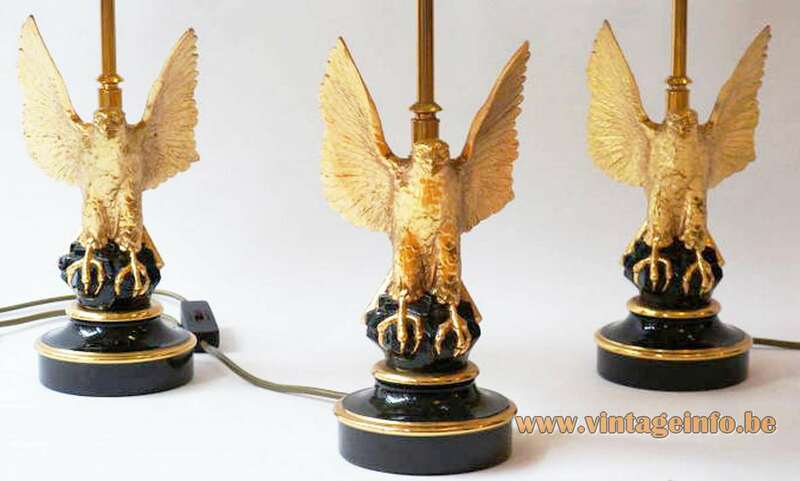 Materials: Black metal round base, gilded rims, gilded eagle. Brass rod and parts. Pagoda fabric and cardboard lampshade. 3 gold coloured brass sockets. Period: 1970s – Hollywood Regency. Manufacturer: Loevsky & Loevsky, White Metal Castings Company, Carlstadt, New Jersey, USA. Other versions: In the period before these lamps were sold, different versions of eagle lamps were made. 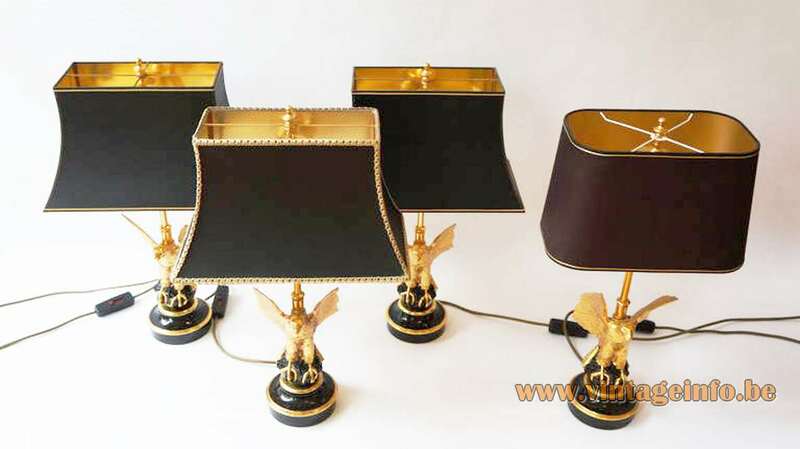 They have 4 decorative candle sticks and 1 light bulb only, a candelabra “Bouillotte” style lamp. 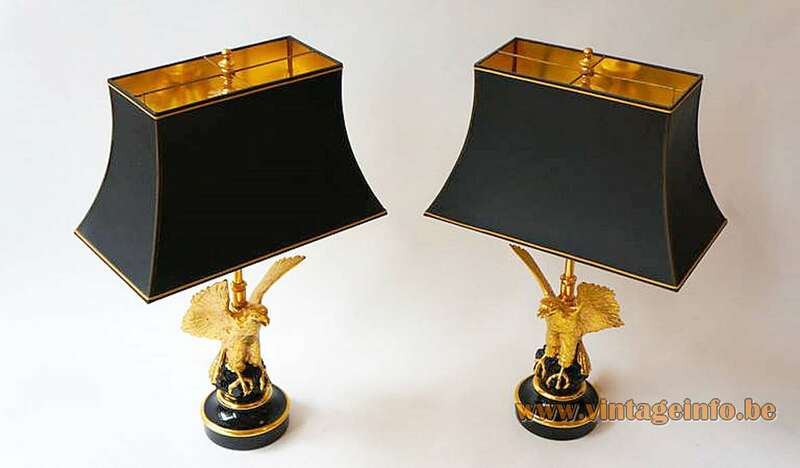 Bouillotte is an 18th-century French gambling card game were these type of lamps were used. Loevsky & Loevsky was founded in 1937 and filed for bankruptcy in the 1970s. 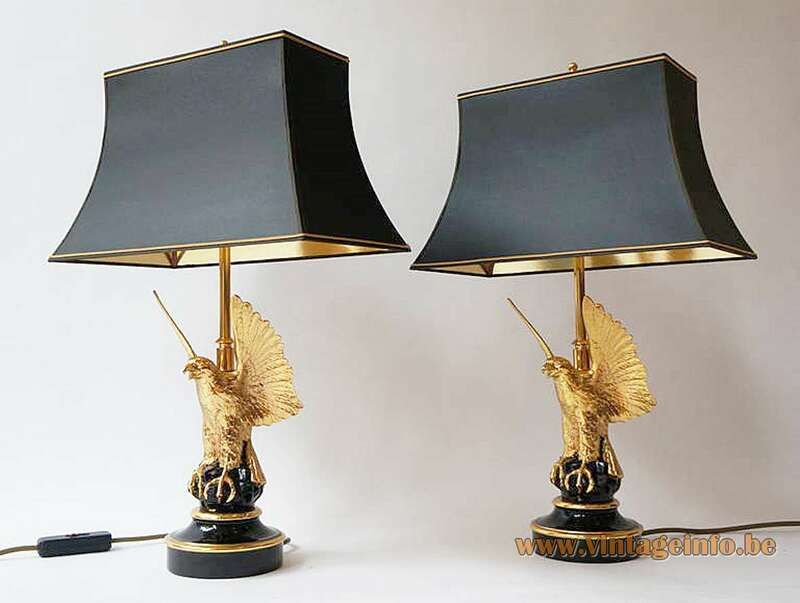 In Belgium these lamps were sold by Deknudt from Deerlijk. 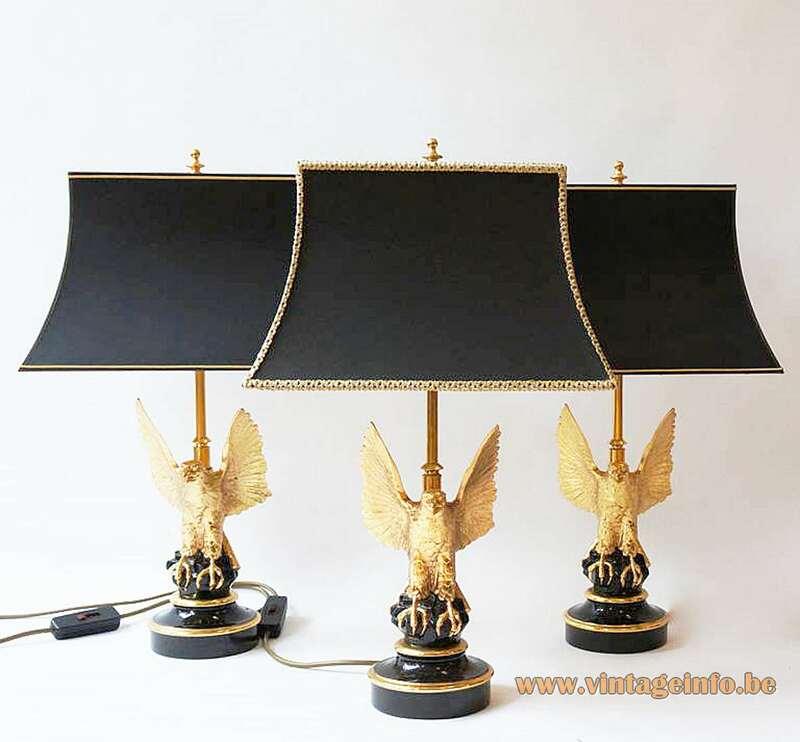 Deknudt Lighting from Deerlijk, Belgium is a family owned business since 1956. 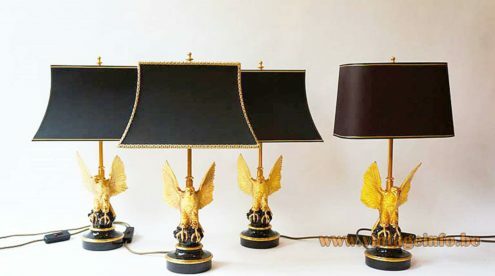 It was started by Armand Deknudt with the production of high end lighting, mainly with brass and marble together with his wife Brita Monbaliu. The company still exists and since 1992 his daughter Lucia Deknudt, together with her husband Francis Clarysse are the owners. 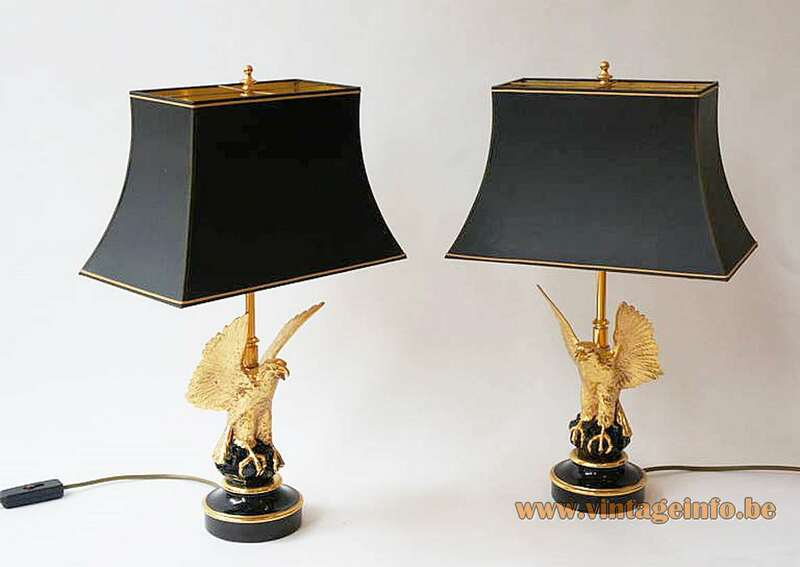 Deknudt sold several lamps produced by Loevsky & Loevsky.